Everyone knows Silicon Valley is an expensive place to live. Renting a two-bedroom apartment will set you back an average of $2,900 per month! But one man rents out a more affordable, innovative space: a tent in his parents’ backyard. And it’s helping him make a ton of money. John Potter set up a nine-by-seven-foot, four-person tent in his parents’ backyard in Mountain View, California, just a block from Google’s headquarters, and listed it on Airbnb. The idea was originally just a joke, Potter told ABC News, but he was soon flooded with responses. At least half the people who contacted him are tech industry professionals relocating to the area and looking for more permanent housing, or those in town for tech-related business. Potter originally listed the tent for only $20 a night, then raised the price to $31, and then $46. Renters can take a shower once a day and eat inside if they choose to. There’s a queen-size airbed in the tent and a hammock for those who prefer to sleep outside. Rental includes access to the family’s Wifi and an extension cord for charging electronics. Due to the overwhelming number of responses he’s received and his father’s poor health, Potter has temporarily taken down his listing, but he plans on putting it back up on Airbnb soon. But he isn’t the only enterprising Airbnb host who is cashing in on tent space. Can You Really Rent Out Your Backyard? Look on Airbnb and you’ll see plenty of hosts offering tenting options. Many of these hosts live in California, likely due to its favorable climate, but you’ll find options available throughout the world. If you have space for a tent in your backyard, consider renting it out on Airbnb or other sites to make some extra income. If you also have a room to rent in your house, even better. Of course, be sure to check all rules and regulations in your area and make sure this kind of short-term rental is legal. You don’t want to run afoul of the law and have to cough up your hard-earned hosting cash to pay fines and legal fees. And be sure to keep safety in mind anytime you’re inviting strangers into your home (or your backyard). Have a bit of land in a scenic spot — or just a backyard? Consider renting out a place for people to pitch a tent, as one California host does. The listing offers a place to pitch a tent on a “minimalistic homestead” in Big Sur for $30 a night. Guests have to bring their own tent, bedroll and bedding, so there’s minimal upkeep for the host. If you’d like to offer a slightly more upscale option, consider pitching a tent for your guests. One Berkeley woman advertises her backyard guest tent as “the perfect stopping place for the outdoorsy traveler.” This tent costs $28 per night and features an airbed, flannel sheets, warm blankets, a down comforter, towels and a battery-operated lantern. Guests can use the house’s kitchen, Wifi, cable TV and more, as well as do laundry or rent a bicycle for a small fee. The weekly rental price is $180, with a four-day minimum and a 10-day maximum stay, though she does allow a few exceptions. If you have a truly special space to share with people, you can charge quite a bit more for a full-fledged “glamping” (“glamorous camping”) experience. In the redwoods near Healdsburg, California, one Airbnb host lets people rent “air tents” for $118 per night. These special rock-climbing tents perch in 200-foot-tall redwood trees and offer a one-of-a-kind overnight experience complete with sleeping bags, pillows and flashlights in the tents, and hot showers and full restrooms below. If you already rent out indoor space on Airbnb, consider offering additional outdoor space for campers. One South Lake Tahoe Airbnb listing lets people camp in the backyard of the Euro-style guesthouse for $39 per night. The guesthouse provides a space for tents and will loan guests a mattress. 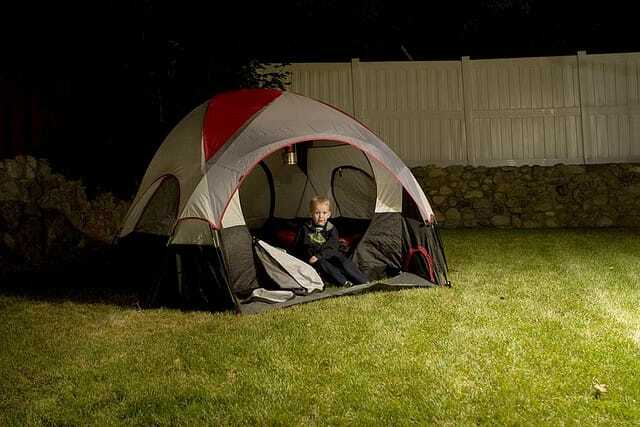 If you don’t have a tent, you’re welcome to sleep on the patio furniture, but you have to wait until other guesthouse users have headed in for the night. The weekly price is $120, and monthly is $325. Backyard guests have “frugal use” of shared spaces, including the bathroom, kitchen and living room, but are encouraged to stay outdoors as much as possible. Your Turn: Would you rent out your outdoor space on Airbnb?